10 years after the last Palestinian Authority elections, Gaza's Islamist rulers demand new presidential, parliamentary elections. Islamist terror group Hamas on Tuesday marked the 10th anniversary of the legislative election it won in 2006 with a call for new parliamentary and presidential polls in Judea, Samaria and Gaza. 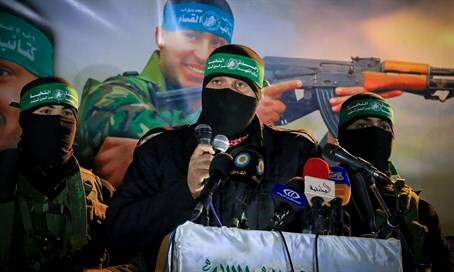 At a news conference, senior Hamas figures in Gaza called for "the announcement of a precise date for presidential and legislative elections." First deputy speaker of Hamas's "parliament," Ahmed Bahar, said Hamas and rival Palestinian factions should work to achieve reconciliation "and to close the gaps opened by years of political division." Palestinian Authority elections have not been held in a decade due to the bitter split between Hamas, which rules the Gaza Strip, and the Ramallah-based Fatah faction led by PA President Mahmoud Abbas. The elections never materialized, with the two sides blaming each other. The PA parliament has not met since 2007, the year Hamas seized the Gaza Strip by force and drove out Fatah from the enclave buoyed by its 2006 election victory. Hamas caused a shock by winning the majority of seats in the polls, but the international community refused to accept the results, demanding that Hamas - whose charter calls for the destruction of the State of Israel and annihilation of the Jewish people - renounces violence, recognizes Israel and respects agreements signed between Palestinian and Israeli leaders. Hamas leaders, mindful of growing frustration with the corrupt Fatah-ruled PA among many regular Palestinian Arabs, hopes it can capitalize to sweep to victory in Judea and Samaria as well.